Easy garlic toast baked in the oven until lightly browned and slightly crunchy. 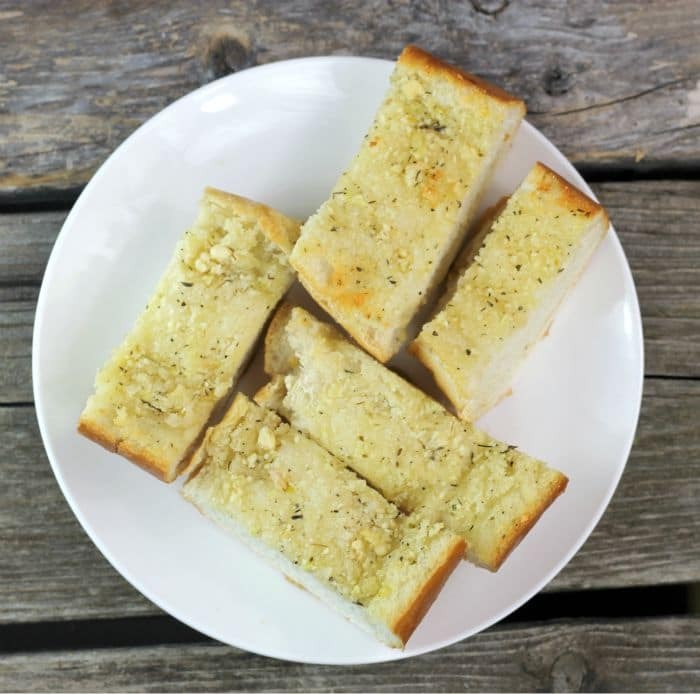 There is nothing better than a slice of warm garlic toast to go with a meal and there is nothing better than garlic toast that is super easy to make. I made this easy garlic toast to go with my last post – Creamy Sun-Dried Tomato Chicken Gnocchi. It seems like I talk about bread a lot on this blog. Most of the time I am making my own bread, but there are occasions when I like to pick up a loaf of French bread and dress it up a bit. In our house, we are known to serve garlic toast with grilled chicken, spaghetti, soup, and the list goes on and on. Really it so easy to make and you change it up in so many different ways. It is delicious any time of the year. Every year we gather at my mom’s on Memorial Day. We make a turkey on the grill, but the high light of the day is the garlic toast. My sister cuts up several loaves of garlic toast and butter both sides of the bread, she sprinkles each slice generously with garlic salt then fries it in a skillet until brown and crunchy. There are never any slices left at the end of the day. 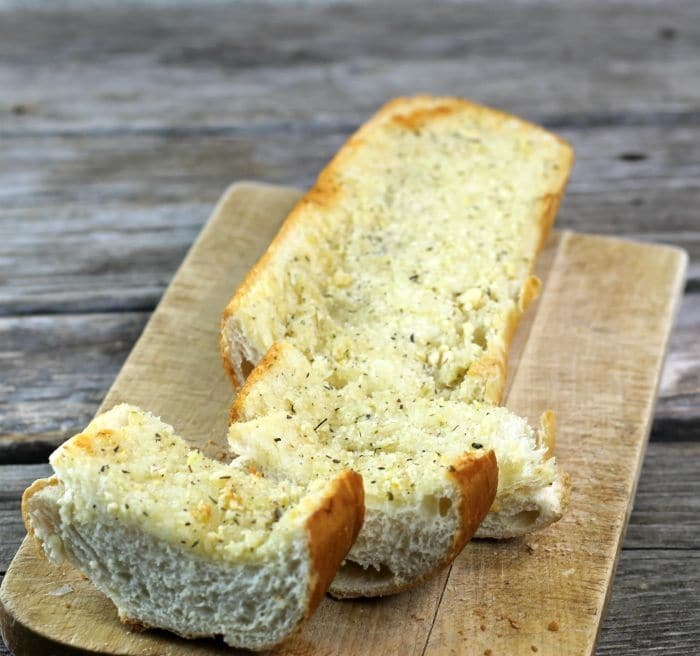 To make this garlic toast take a loaf of French bread and slice down the middle (lengthwise). You will want your butter soft, but not melted. In a bowl, you will mix the softened butter, olive oil, Parmesan cheese, Italian season, and minced garlic. You will divide this mixture between the two halves and spread over the bread evenly. The bread is wrapped in aluminum foil and baked for 20 minutes after the 20 minutes unwrap the bread and bake for an additional 5 minutes. If you prefer a crunchier garlic toast continue to bake until the desired crunchiness. 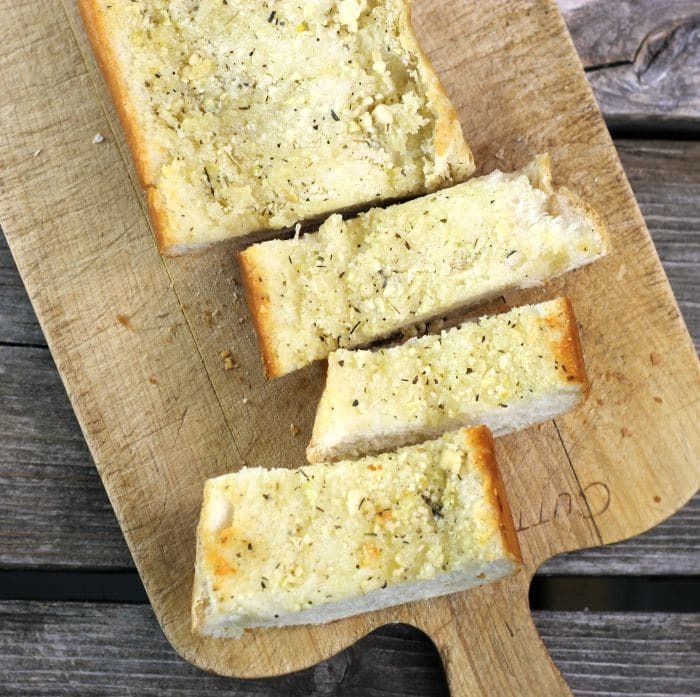 Easy Garlic Toast made with French bread that's topped with butter, olive oil, Parmesan cheese, Italian seasoning, and of course garlic perfect for almost any meal. Divide the butter mixture between the two halves. Spread the mixture evenly over each half. Wrap each half in aluminum foil. Set the bread on a large baking pan and place in the oven. Baked for 20 minutes. Unwrap and bake an additional 5 minutes or until the desired crunchiness. Calories are just an estimate. Nicely crunchy and full of flavour…love the ease of preparation too. This sounds delicious, Dawn! I see the frozen garlic bread at the store, and I just have to laugh. 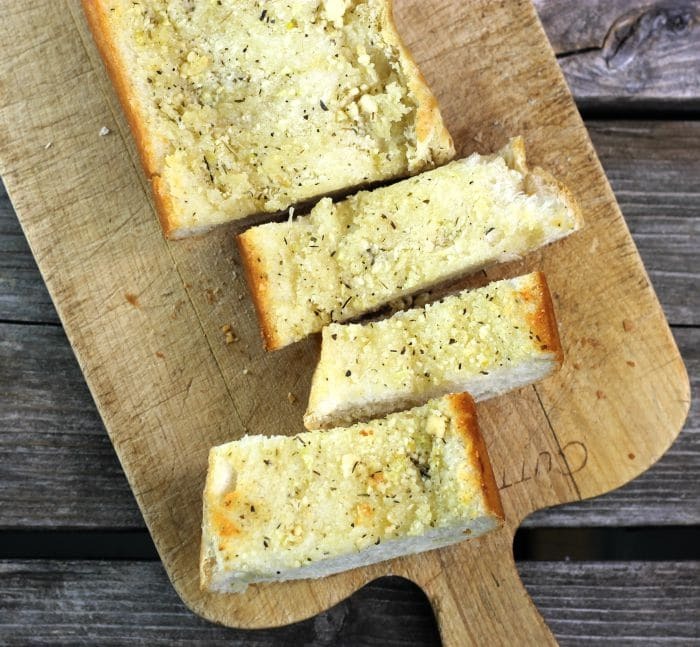 Garlic bread just needs to be made at home! And this sounds like a great recipe. I’ll take a half loaf, please! 🙂 Hope you had a great weekend, my friend!